Years ago and the day before my first visit to the Donna Karan Company to meet Donna and her senior leadership team, I spent a lot of time thinking about and planning what I would wear. At the time I did not own one piece of her line of clothing, although I would have loved to. Instead I would buy designer clothes only when they were on sale, and I did not have a favorite designer. From time to time I shopped at designer outlets to find my "status apparel," which I proudly wore to the appropriate parties. While I almost became a designer out of high school, that was long ago. My design instincts for apparel had given way to my instincts for helping executives create the future of their businesses, and I was okay with that tradeoff, until I met Donna Karan and her twenty five senior executives. The suit I chose for my first visit was quite beautiful: a taupe and white wool with an Italian designer's name on the label-someone I never bought from before, or after. It had a Chanel look, and in my mind, I was dressed appropriately for the occasion. I even treated myself to a new pair of shoes on my way over to her offices. Feeling I was taking all the right steps to "fit in," I proudly headed for her 1440 Broadway office in New York City. One of my friends had told me a story about the day he left a client meeting, having just closed a big deal. He was walking with his head in the air, strutting around wanting to yell to the world about his success. As he strutted with his head in the air, oops! He fell right into loose cement in a newly paved sidewalk. Standing there with his leg covered in wet cement up to his knee, he realized that when we are too cocky, we fall. As I strutted to the offices of the Donna Karan Company, feeling cocky, with my head high in the air, oops! 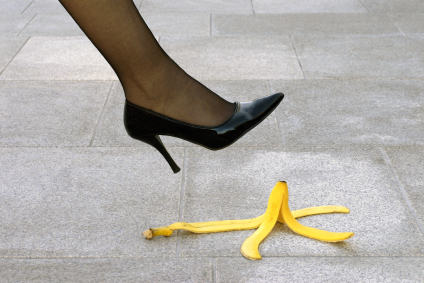 I fell down and tore my brand-new stockings and scraped my brand-new shoes. Okay, so I got my first wake-up call about what I was stepping into. I arrived at their offices and sat in the lobby for almost twenty minutes. I was feeling like maybe they forgot me. I did the best I could to hide the torn stocking and scuffed shoe. I called a few people on the phone to pass the time, read every magazine in the lobby, and then was finally called in to talk with twenty-five of the top senior executives in the company, including the presidents of each division. I stood up, feeling like I was ready, in spite of the past two hours, to make a good impression. As the door opened, I got the shock of my life. It took a few seconds to fully sink in. There I stood-all alone-in my beautiful taupe suite, surrounded by two dozen executives all wearing black-black suits, black pants, black tops. As forty-eight eyes stared at me and I stared at them, I realized I was being checked out at all levels. Would I pass this test? What was the test? Those twenty-five seconds felt like two decades. The sweat formed under my arms. I realized something was going to happen that I was not prepared for. Before I opened my mouth, the die was cast! Whether I wanted this to happen or not, I certainly stood out in that crowd. Everyone wore black, as it turned out, because Donna felt she could design better without lots of colors around her to interfere "mentally and physically" with her design mind. Unbeknownst to me, black was Donna Karan's company dress code. In fact it was more than that. It was DKNY's Brand which was a major part of the Donna Karan Corporation's culture. We agreed that I would work on retainer, and spend four to five days a week with Donna and her senior team. Our first event was called a VisionQuest, and took place over a three-day period. I was coming to work in "toned-down" clothes, and caught on to the black theme quickly. However there were more lessons to learn. The week before the VisionQuest, Donna told her assistant to "take me to the closet." This felt reminiscent of sitting on the dunce chair in elementary school for being bad. In the closet, however, were wonderful things from which I could choose to outfit myself for the VisionQuest. If the company was going to be led up the mountain to reach their new vision, I had to look the part, and wearing anything other than DKNY clothes was a no-no. Donna's assistant's job was to dress me for the VisionQuest. I was told never to wear my Ferragamo shoes again-even if they were black. You don't mix Ferragamo with Donna Karan apparel-ever. Better I should wear white sneakers than black Ferragamo shoes. And then there is Ellen Tracy-not a designer worth buying ever again. And so my jacket was retired. Two hours-and three outfits-later, I was ready to face the senior team with a new sense of power and equality. Once I was brought in as a full-time consultant, I purchased and wore Donna Karan clothes, acquiring dozens of black items. Strangely enough, over time I became sensitive to the variations in black and, after a while, my wardrobe started to feel interesting. There was blue-black and gray-black. There was red-black and brown-black. Dye lots are all different, and over time my perception of variations of black expanded, so that I could actually see when blacks didn't match. What I discovered, as we all do, is that when we step outside a culture by acting, behaving, speaking, and dressing differently, people react to us as though we are outcasts, or we feel like outcasts. 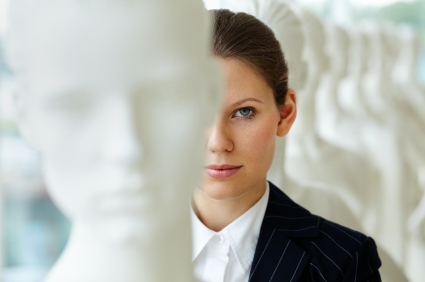 Learning how to fit in, and at the same time speaking our own voice, is one of the biggest challenges all employees face while integrating into a culture. Over time I started to realize that I could "test the cultural waters" and include beige, tan, white, and blue in my wardrobe without feeling like I was "challenging the cultural norm." This took time for me, as I was feeling what it was like to enter a new culture and adapt to it. Pushing back on a significant norm, in the beginning, caused me anxiety. I did not have the boldness to test the waters without fear of loosing my newly contracted business relationship. In the beginning, all I saw was black surrounding me, so I dressed in black. Once I settled in, I found myself getting more comfortable and, as this occurred, I was able to see different things in my environment. This is an important principle for us all to recognize. Fear influences our attention by filtering out lots of things from our awareness. While I was orienting myself to the new culture, I saw only black. Black became a "rule"-it was an "all or nothing" rule that I created to fit in. As I lowered my protective shell and felt more comfortable, I began to see other colors. The rule changed to black, plus tan, or black, plus white. I found my wardrobe diversifying as I became more comfortable in this new culture. From time to time Donna would remind me when I faltered on my design choices (like the time I wore another designer's stockings to a sales force design meeting). How she could tell they were not mine is part of Donna's talent. She could see the smallest of differences not visible to the naked eye. When I walked, the stockings didn't hug my legs the way her stockings did. In this very wonderful moment of embarrassment, she asked me to raise my leg and show everyone in the room-all sixty-five salespeople-what not to wear to work but why her stockings were better! In that instant she reinforced to her salespeople the power of the Donna Karan brand. This is what we all face when we join a culture. When we are in line with the norms, we are rewarded. When we are not in line, we are punished and then it's up to us to determine how much we can comfortably push back. The flip side of "wearing black" is that each culture has and creates its identity. Once you sense what it is, you decide if you want to join. You do what is expected and are rewarded: you are invited to the right meetings, you get to sit in the power seats, and you are asked for your opinions when it counts. The clues for fitting in become transparent over time, as we watch those who embrace the sometimes cult-like behaviors that win favor. 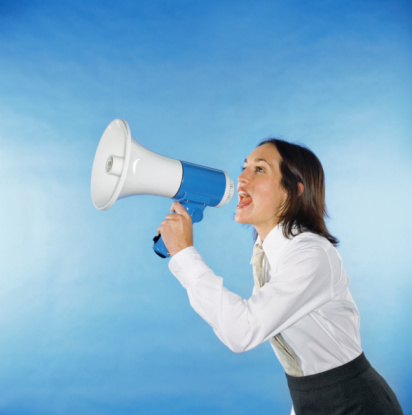 In some cultures, speaking up gets rewarded, while in many others, speaking up does not. In some cultures, it's okay to be late to meetings, because it means you are "important" and have been invited to many other meetings. In some cultures, it's a sign of being a hero when you can talk about having 100 e-mails in you box every morning; in other cultures, the hero story would be how many meetings you were invited to attend. Some of us might feel that living the norms is a form of conformity, and therefore akin to a military academy dress code, and, in reality, it is. And for those who choose to join the academy or sorority, it is a sign you have opted in. Sometimes outsiders do feel excluded or left out. In some cultures, dress code is not as important as it would be in a design firm, yet it is considered even at an unconscious level. So a few years after my consultancy with Donna Karan International, I was asked to interview to become an executive coach for Massimo Ferragamo and his senior team. Hindsight is always the best teacher, and the day of my interview I spend an hour shopping in his store which sat next to the executive offices on 5th Avenue. I had a blast going over all my options and landed on a wonderful pair of Ferragamo shoes. As I sat in the executive suite lobby awaiting my interview I glanced over at the showroom display of Ferragamo's original shoes and realized that I had actually picked out a 'classic style' of Ferragamo shoes - I was so proud of myself! Massimo was ready for me and his assistant ushered me into his office. As I entered the room he stood up and we both reached out our arms to say hello and before our hands touched he looked down and said, "Nice shoes!" Our meeting was quite quick and I felt that perhaps I said something wrong. In face it was the opposite. I said something and did something right. Wearing his apparel did make a difference. He called in his head of HR to close the deal. She walked in to say hello and it was déjà vu all over again. She looked down and said, "Nice shoes! And they are named after me - the Amy Shoe!" 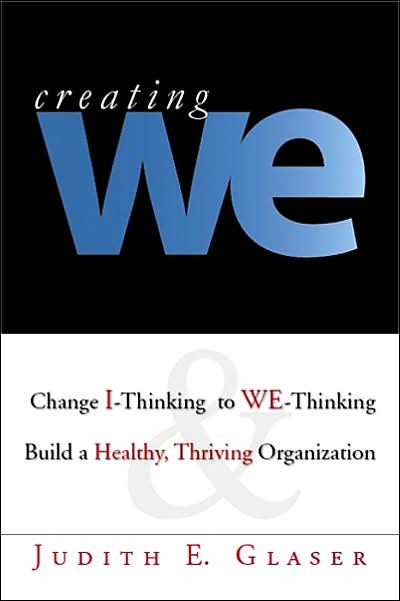 Adapted from one of Glaser's best selling books: Creating WE: Change I-Thinking to WE-Thinking & Build a Healthy Thriving Organization.